The below artworks are the most important by Ed Ruscha - that both overview the major creative periods, and highlight the greatest achievements by the artist. Artwork description & Analysis: View is a collage that acts as a commentary on photography's role in the post-war United States. The central focal point is a silver gelatin print of a painting by Joe Goode, one of Ruscha's housemates, depicting a star above three stripes. This painting, unframed, is photographed against a grey backdrop. This image is mounted with photo corners onto a piece of black paper, which occupies the bulk of the frame, and the word 'VIEW' is written above the painting at the centre while '1960' and 'OCTOBER' provide two additional lines of handwritten text below. This collage is completed by its frame, which is gold and wooden, and by the paint splattered across the glass. Ruscha differed from contemporaries such as Andy Warhol and Robert Rauschenberg in his decision to take his own photographs, rather than using found images, but has frequently dismissed photography as a fine art. Ruscha uses photography as a tool for communication rather than as an end in itself; his emphasis on the organisation of images, through collage or in books, has been tremendously influential. View subtly alludes to ways in which photography was encountered in the mid-century USA, with the black-and-white image of Goode's painting suggesting the reproductions through which art students often encountered canonical works and the photo corners attaching the photograph to the black paper suggestive of a family photo album; this combined references to fine art alongside casual snapshots serves to question the ways in which audiences relate to images and their means of circulation. The splatters of paint across the glass, meanwhile, draw attention to the constructed nature of the photographic image, emphasising the surface as a screen rather than a window into the world. Ruscha used a Yashica 1 ¼ camera to make View and developed the central image in a basement darkroom shared with his housemates; Yashica cameras, requiring the photographer to look down toward a mirror rather than directly at a subject, emphasise the distance between photographer and subject, and this is echoed by Ruscha's treatment of Goode's painting, which is abstracted, flattened and deemphasised as it is transformed into a compositional element. Artwork description & Analysis: Ruscha claims that Boss was his first mature painting. It was the first of a long series of word paintings where Ruscha created single-canvas works each featuring a word with strong connotations and a powerful visual impact. Later versions included Honk, Smash, Noise, and Oof. Ruscha later stated that the word "boss" "was a powerful word to me, and it meant various things - an employer, and a term for something cool. Also, a brand of work clothes." Ruscha uses this multiplicity of meaning to encourage the viewer to consider all the subconscious connotations of the word. This could be expanded to an exploration of the subconscious meanings hidden in all forms of language. Art historian Margit Rowell argues that looking at Boss is similar to looking at a billboard from a car window, which is not dissimilar from watching the opening screens of a movie. Ruscha used thick layers of oil paint to create Boss. His use of impasto and dark-brown and black paint gives the word a heavy visual weight as an image-object as well as a linguistic signifier. It also has what Ruscha has called "a certain comedic value," since there is an element of the surreal or the absurd about placing so much emphasis on a commonplace, mundane word. The painting doesn't take itself too seriously, and is playful as well as thought provoking. 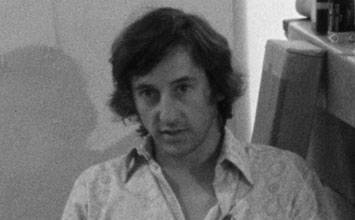 Ruscha later said of his work, "I'm dead serious about being nonsensical." Artwork description & Analysis: This 48-page booklet entitled Twenty Six Gasoline Stations was inspired by Ruscha's journeys to Oklahoma City from Los Angeles, a road trip he made several times a year to visit his parents. He claimed that the gas stations he encountered along the way became "like a musical rhythm to me - cultural belches in the landscape." He took photographs of the gas stations, stopping the car across the road and getting out to capture them. He would take the photographs quickly, trying to avoid deliberate or artful compositions, resulting in an anti-artistic style that was to become highly influential with photographers in the future. This deliberate rejection of traditional art photography was intended to make his audience think about why they ascribed aesthetic value to particular visual conventions. He said, "people would look at it and say, 'Are you kidding or what? Why are you doing this?' That's what I was after - the head-scratching." Although they were taken on journeys, there is no narrative to the final series of images. Instead they have a detached, documentary quality. Critic and director of the Getty Museum Timothy Potts describes them as "deceptively simple," pointing to a deliberate aesthetic choice by Ruscha. The book was originally released in a self-published edition of 400, which Ruscha sold for $3 each. Building on his experience working with a printing company, he utilized his skill in typesetting and photo offsetting in order to print the book using a professional printing press. The resulting small paperback booklet, with its everyday and unglamorous subject matter, was a deliberate alternative to the glossy, expensive books created by other artists. Artwork description & Analysis: Large Trademark with Eight Spotlights is an 11ft-wide painting featuring the 20th Century Fox logo, a well-known image from the beginning of many Hollywood films. This is one of several pieces that deal with the culture of Hollywood in Ruscha's Los Angeles. The wide format recalls widescreen movies in the cinema, or the shape of advertising billboards. The logo is presented as if in the opening credits of a movie, seen from below, as if the viewer were looking up at a large sculptural version of the logo. Laurence Goldstein explains how "Ruscha thumbed his nose at 'good' art composition, by pushing the massive trademark and its backdrop of searchlight beams to the far left. Our eyes are trapped and held there." In this painting, as in much of Ruscha's work, the words of the trademark have been reified, turned into a three-dimensional object much like the famous Hollywood sign. The boldness and three-dimensionality of the words points to the overwhelming prominence of Hollywood in Los Angeles in the 1960s, and of particular brands or "trademarks" within the Hollywood industry, some of which Ruscha felt were becoming almost synonymous with the movie industry itself. He is neither wholly celebrating nor wholly condemning the consumerist culture of Hollywood, but rather painting an image of the industry as he sees it: powerful, exciting, brand-oriented, and ubiquitous. Although Ruscha's presentation is intended as ambiguous, an ambiguity that is sometimes argued as rendering contemporary art meaningless, it still elicits a mixed response within the viewer in which preconceived ideas about the subject are confronted and either validated or challenged. Artwork description & Analysis: "Norm's" is a beloved 24-hour roadside diner located in La Cienega in Southern California. This painting is one of a series in which Ruscha depicted local landmarks on fire, including a gas station and the Los Angeles County Museum of Art (LACMA). The fire in Norm's, La Cienega, on Fire is stylized, almost like something you might find in a cartoon or graphic novel. The contrast between the striking red flames and the blue sky makes the fire appear melodramatic and slightly surreal; it is deliberately eye catching but doesn't portend any real danger. The striking diagonal line that breaks up the painting adds to this effect, and makes use of one of Ruscha's favorite compositional tropes, also used in paintings such as Large Trademark with Eight Spotlights (1962). The diagonal wedge also creates an image of the diner as it might be seen from a car speeding past at night. For Ruscha, diners in Southern California such as Norm's had become visual icons. For him, they were symbols of a particularly American culture and landscape. This is evident in the painting's title, in a play on words typical of Ruscha; the diner's name, "Norm's", points to its normality and its role as the "norm" within everyday American life. By depicting it on fire, Ruscha's painting acts to "torch" those "norms and standards," as critic Michael Darling puts it, but it also acts as a celebration of those norms. This paradoxical approach is typical of Ruscha's work. Artwork description & Analysis: This piece is a prime example of Ruscha's endeavor into trompe l'oeil style work in which he takes a widely-known word or concept and paints it as if it were made of a viscous liquid, seemingly poured directly onto canvas and made to seem three-dimensional through his meticulous use of shadow and light. Annie was the name of a little orphan girl, a central character in a namesake popular movie of the time, who stole the hearts of America. By painting the name as if it were made of bright orange maple syrup, Ruscha presents a characterization of the text as vibrant, sweet, and warm. It also lends a surreal slant on a totem of popular culture. Artwork description & Analysis: This book, folding out to twenty-seven feet, records every building on both sides of Los Angeles's Sunset Strip. Designed as an accordion foldout, the south side of the street extends from east to west along the top of the book while the north side is rendered upside down along the bottom, as if the central space in which addresses and names of cross streets are recorded were the road itself. Each structure has been photographed separately; the images are collaged together with an emphasis on documenting the buildings, with vehicles in the foreground often cropped abruptly. Ruscha's survey begins with Schwab's Pharmacy and a Chevron gas station at the corner of Laurel Canyon, scrolling past motels, liquor stores, restaurants and an art gallery, among other sites, before finishing at 9171 Sunset Boulevard, close to the corner of Cory Street. The buildings are photographed from a frontal perspective and appear flat, with few shadows that would otherwise allow the viewer to get a sense of their three-dimensionality. Ruscha has described Every Building on the Sunset Strip as a "historical archive" and it can be seen as a demonstration of his belief that photography was best used as a means of communicating information. In this book, buildings are displayed without emotion and without hierarchy; each is given equal attention and photographed, in the same unstudied way, by a 35mm camera mounted atop a car. The Sunset Strip was, at this point, seen as emblematic of Los Angeles and Ruscha, as occurs often in his oeuvre, plays with the city's mythology and reality, depicting it as simultaneously unreal and underwhelming. Ruscha's portrayal of the Sunset Strip unfolds cinematically, with the viewer encountering images in sequence, as if in the passenger's seat of a car. His portrayal of the buildings as two-dimensional, encountered only through their facades, similarly recalls the film industry for which Los Angeles was and is known, appearing as false as structures erected to serve as backdrops. Every Building on the Sunset Strip also anticipates postmodern theorisations of the city; a few years later, Denise Scott Brown and Robert Venturi would film the act of driving down the Las Vegas Strip as part of their investigations into the significance of vernacular architecture for Learning from Las Vegas (1972). Every Building on the Sunset Strip, like the earlier Twentysix Gasoline Stations, was immensely influential, encouraging a generation of photographers, prominently including Lewis Baltz and Stephen Shore, to capture the USA as they encountered it, minimising attempts to idealise or construct. Artwork description & Analysis: In the 1970s, burdened with a temporary malaise toward working with oil paint, Ed Ruscha began working with non-traditional and organic materials to create his artworks. He explained, "the first work that I did involving vegetable matter and organic materials came out of a frustration with materials. I wanted to expand my ideas about materials and the values they have." But beyond a simple experimentation with medium, his use of food materials in work such as 1972's Dance? also contributes to the overall meaning of the piece which is atypical of other Pop artists who merely used traditional tools to elevate everyday words or objects. His application of coffee, condiments, and even cheese, reflected the genuine foods that might be served in a common American diner of the time. This, in conjunction with the single word Dance, the popular pastime of the day, colored in the hues of imagery and fashion of the 1970s, imparts a full immersion into the very experience Ruscha wishes to convey. The question mark eludes to the variety of options readily available in a consumerist society. He has said that "all my artistic response comes from American things", and this particularly American sensibility is evident in Dance? The painting also reflects Ruscha's constant engagement in contemporary culture. Artwork description & Analysis: As well as experimenting with non-traditional materials, in the 1970s Ruscha made a series of "catch-phrase" drawings, where phrases are overlaid onto colorful backgrounds. In Pretty Eyes Electric Bills from 1976, the words "some pretty eyes and some electric bills" are set against a field of sky blue pastel. A tension is created between the lettering and the background. The pastel blue is soft and hazy, maintaining evidence of the artist's hand. Otherwise, the text is set in rigid typography using the tools of graphic design. This juxtaposition of art and design points to Ruscha's attempt to break down the distinction between the two disciplines, and between high culture and low culture, in a way that is typical of the aims of the Pop art movement. The two halves of the "catch-phrase" are also highly incongruous: the first half is evocative of romance and beauty, while the second half refers to mundane household nuisances. Ruscha later stated, "Pretty Eyes, Electric Bills is my way of separating two subjects that are on the far end of the world from each other. This somehow gets to be the reason that I want to make a work of art of this discord." The inclusion of the word "some" in both halves of the phrase acts as a qualifier, but has the effect of making the entire phrase even more vague. The sense of mystery evoked by this is deliberate, and points to Ruscha's aversion to straightforward messages or "morals" in his works. Instead, his aim is to make the viewer consider every aspect of his work more closely. Artwork description & Analysis: Later in his career, Ruscha started to explore landscapes that were alien to his Los Angeles home, and from the 1980s he began to work on a series of paintings where he presented landscape views superimposed by text. Here, snow-capped blue mountains sit against a yellow sky, while the incongruous phrase "Pay nothing until April" is overlaid in the foreground. The piece was created by spraying the canvas with an initial layer of paint, before building it up further with mid-sized brushstrokes. He said of the project, "it's not a celebration of nature. I'm not trying to show beauty. It's more like I'm painting ideas of ideas of mountains. [...] Mountains like this were only ever a dream to me." The relationship between the text and the mountain landscape seems mysterious or inharmonious. In this way, Ruscha invites the viewer to consider both the everyday phrase and the background more closely as they try to ascertain the connection between the two. The phrase "pay nothing until April" echoes the language of advertising, where customers are encouraged to commit to a product now but not pay for it until a later date. The painting is about the size of a shop-window travel poster and the combination of words and image may conjure an advertisement for a ski holiday or airline flight. The font, which is clean and modern, was designed by Ruscha and is intended to indicate what he described as a "no-style". The painting points to a view of the world, which is detached and distant, and compels the viewer to accept that logical connections can't be pre-supposed.